In addition, the AAUSAT5 student team (from Aalborg University) was invited to join the workshop, in the framework of a collaboration between the Education Office and the ESA Human Spaceflight and Operations (HSO) Directorate. The workshop aimed at introducing the CubeSat teams to the activities to be performed for the preparation and execution of the environmental test campaign, and the preparation of the Data Package for Phase 2. 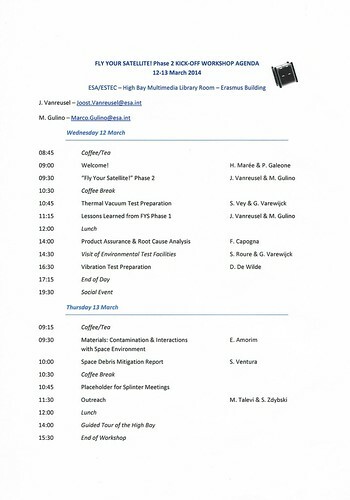 Below there is the agenda of the workshop. ESA experts presented a lot of interesting things, in particular the thermal vacuum and vibration test that [email protected] will undergo in next months! Moreover, this workshop gave us the opportunity to meet some of the members of the other two teams.